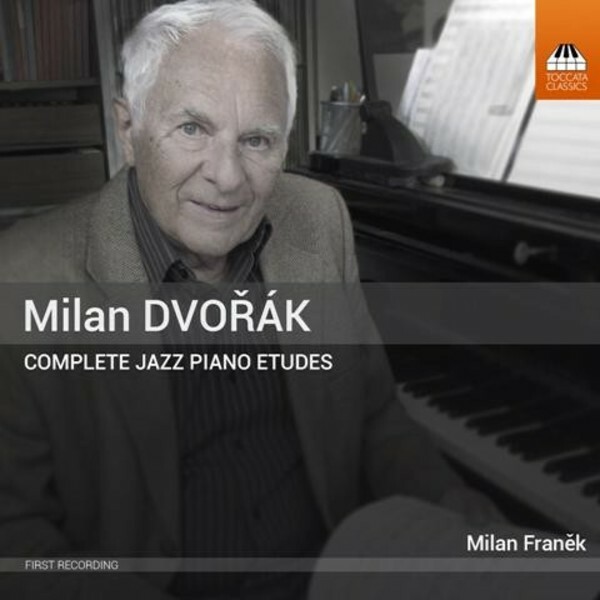 The Czech composer Milan Dvořák (b.1934) – no relation to his better-known namesake – has been a well-known pianist in Czech swing groups and big bands since the 1960s and is still active as a performer, in his early 80s. His 45 Jazz Piano Etudes developed from transcriptions of popular songs, with a first volume appearing in 1971 and the second in 1985. Dvořák’s aim was two-fold: to keep the music within the range of amateur jazz pianists and yet maintain the harmonic, melodic and rhythmic interest of each piece. These sprightly miniatures have been taken up the world around, but this is the first time they have been recorded. This recording was made in direct consultation with the composer, who also advised on details in the booklet commentary. Milan Franěk studied at the Conservatoire in Pilsen and the Academy of Performing Arts in Prague, at the University of Music and Performing Arts in Vienna and in Graz and at the Charles University in Prague. He is also a prize-winning trombonist. He has taught at various music institutions and music universities both in the Czech Republic and abroad. He has been the President of the European Piano Teachers Association (EPTA) for the Czech Republic since 2010. This is his first recording for Toccata Classics.